200 elementary school children have signed up to learn more about energy and engineering tomorrow in Billings. Industry representatives will be leading hands-on activities while members of Billings Senior High’s STEM Society will be there to mentor the K-through-6th graders. 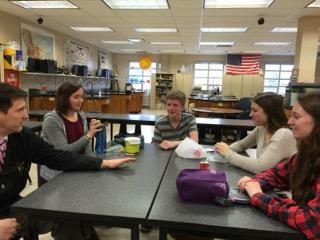 Senior High Chemistry Teacher Craig Beals (L) talks with the executive board members of Senior High's STEM Society. From Beal's left are Grace Ostermiller, George Dyre, Claire Griffin, and Payton Harrison. “I’m giving up my Saturday because I have a younger sister and she got really excited when they started having these STEM Saturday’s,” says Junior Grace Ostermiller. STEM stands for Science, Technology, Engineering and Math. Members of the Senior High STEM Society will be at this event to share their enthusiasm for math and science. “I’m taking physics right now and it’s probably my favorite class that I’ve ever taken just because of the content of the things you learn about and how it relates to everything else,” says Senior Payton Harrison. Junior George Dyre says he’s also eager to share his love of wanting to know how and why things work. “Cause I’m super interested in space and aeronautics and stuff and so I’m just looking forward to pass on that same knowledge to other people while learning more about it myself,” he says. All four of these high school students are members of the executive board for Senior High’s STEM Society. Chemistry teacher Craig Beals is their faculty advisor. He says Saturday the role for members of the STEM Society will be as mentors. Saturday’s Energy and Engineering STEM Saturday event at Orchard School is sold out, even though the organizers raised the attendance to 200. The event is sponsored by STEM Billings. Registration opens in early March for another STEM Saturday event. This one focuses on the medical field.